Black Dog Tribe is a UK-based site that focuses on providing a community where those with mental health issues can gather to share their stories, get support, discover news about mental illnesses and connect with others. Its primary focus is depression. The “Black Dog” part of the name comes from a British term for depression: the Black Dog. It is not related to the Led Zeppelin song of the same name. * Winston Churchill is credited with coining it when he described his depression as having “a black dog on my back” but it was a commonly used phrase at the time. 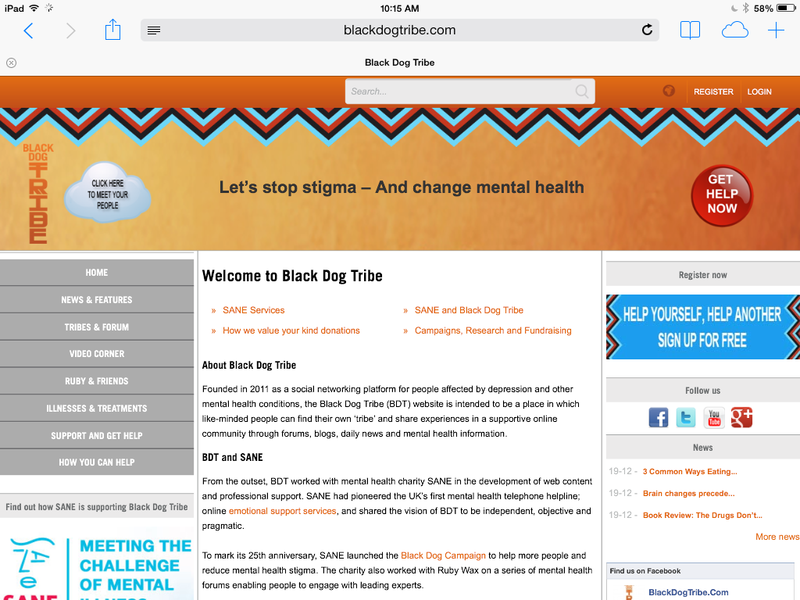 Black Dog Tribe is part of SANE’s Black Dog Campaign, focused on ending the stigma of mental illness. Like the SANE website, Black Dog Tribe offers lots of information. Unlike SANE, the information on Black Dog Tribe is primarily provided by community members. There is less information to wade through here than on the SANE site and all of it is clearly labeled. All of the key links appeared at the top of the screen on my iPad and my laptop. Support is easy to access through two links; one, labeled Get Help Now, is clearly visible as a bright red button. The site is cheerful, like the SANE site, and user friendly. Each of the sections has its own color so they stand out. A quick scan and you can find what you’re looking for. Topics vary depending on the section you’re visiting. Like Minds, for instance, offers these topics: “Tell us your story”, “I feel alone”, “How bad are you now?” All sections invite members to suggest a topic, which can be interesting. I explored “How do your partners deal with your depression” under the “I feel alone” topic. Turns out my partner is a gem. This is my favorite section, covering a wide range of breaking news topics, with an emphasis on research. The news for 12/19/2013 includes a story on cat bites triggering depression. I subscribe to the Twitter feed and always find something I want to click through on. Provides information from SANE on symptoms of an extensive list of mental illnesses and disorders. Ruby’s Room and Ruby’s Blog both lead to sections that haven’t had a post since 2012. Ruby is one of the founders of the Black Dog Tribe but I couldn’t find her last name anywhere on the site. Clicking on the Meet Your People cloud on the first page leads to a fun interactive graphic listing the tribes available and the topics within them. Clicking takes you directly to the forums. The Tribes link under Tribes and Forums leads to a video of Ruby describing the tribe. Best bet is to click on the cloud. There is a note about triggering on the site, but that warning is not repeated on each of the forums. I saw it once and can’t remember where. Black Dog Tribe is a crazy good resource if you go there prepared for possible triggers. I wouldn’t check it out on a down day. *Black Dog, by Led Zeppelin, got its title when a black dog walked into the studio during recording.